Old farmhouse a stone's throw from Castiglion Fiorentino. 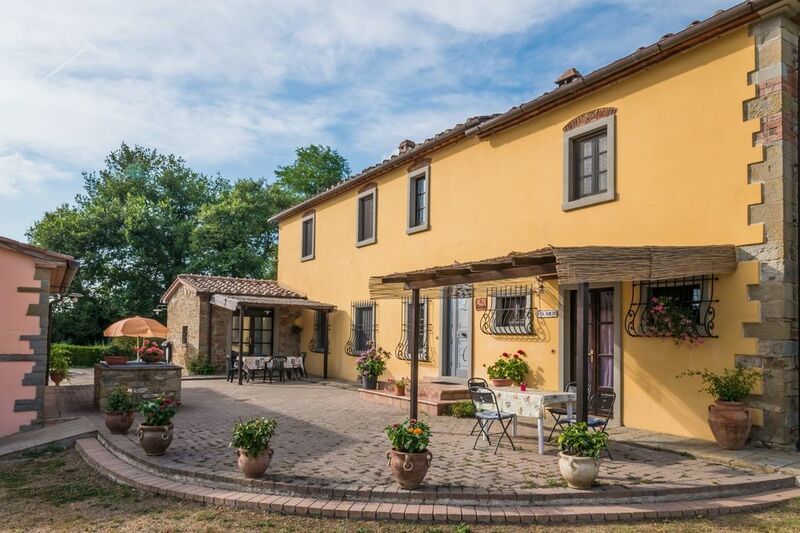 Villa La Crosticcia is an old farmhouse divided into three apartments, and located very near to Castiglion Fiorentino, it is ideal for those who want to get away from city life and live in contact with nature. The warm colours of the ancient farmhouse, the silvery green of the olive trees, the bright blue of the swimming pool, expertly combined with the efficiency of the way it is run and the helpfulness of the owners, guarantee a peaceful and restful holiday. The pool, the vegetable garden at disposal and possibility to taste the farm organic products. The Villa is expertly furnished with rustic furniture and equipped with all the modern comforts. In the large garden all around the villa there are a beautiful swimming pool (6 x 12 m, depth 0,90 -2,20 m), equipped with garden furniture, barbecue, children playground, two shaded car spots, the vegetable garden from which guests are free to help themselves to seasonal vegetables. Next to the pool a bathroom with shower wheelchair accessible.. The farm's produce offers the guests the opportunity to taste and buy organic products such as olive oil, wine, jam, fresh fruit, vegetables, chestnuts and honey. The garden is completely fenced. On Ground floor there are 2 apartment, one comprising sitting/dining room with kitchenette, double bedroom with added single bed, bathroom with shower and bath. Pergola equipped to eat outside. The other suitable for disable persons, comprising sitting/dining room with kitchenette, double bedroom, twin bedroom, bathroom with shower and bath (suitable for disabled except for the shower). Pergola equipped to eat outside. First floor: with access via internal stone staircase, with kitchen/dining room, sitting-room with fireplace and sofa, double bedroom with en-suite bathroom with shower, double bedroom with added single bed, bathroom with shower and bath. Gazebo equipped to eat outside. EQUIPMENT: Satellite TV, oven, dishwasher, microwave,freezer, high chair, toaster, filter coffee maker, washing machine, Wi-Fi Internet access, mosquito nets, air conditioning. Greats thanks to CHIARA and the whole Family! it is a great Destination. Our familiy (4 couples, 2 Children, 2 Babys) had a Beautiful week at the villa La Crosticcia! Every morning chiara keeps the pool clean, is watering the garden and the Flowers! there is enough place for swimming, playing, reading! Wir haben uns sehr sehr wohl gefühlt - eine Destination, die für Klein und Groß herrliche Urlaubswerte bildet. Die Nähe zu Cortona und Arezzo bietet auch die Möglichkeit, Kultur zu genießen. We had a perfect vacation here! The house was more than big enough for everybody, we stayed here with 6 adults en 5 children. Everything was very clean and shiny, aswell as the pool. You can see and feel that the owner takes great care for everything!! Every moring she cleaned the pool, watered the flowers, cleaned the bbq and brought us more wood for the bbq. She gives a great service to her "customers", more than you can expect, if you need something, all you have to do is ask! !